I had a lot of topics on my mind, and Jim graciously gave me great freedom to roam off topic constantly. When Jim's good podcaster friend Mike Wieger @WiegerTech of 29|80 joins, it's always fun and insightful. Paul Braren from TinkerTry.com (http://www.tinkertry.com/) and Twitter (https://twitter.com/paulbraren) joins Jim Collison https://twitter.com/jcollison and Mike Wieger from http://2980network.com/ for show #259 of Home Gadget Geeks brought to you by the Average Guy Network, part of http://thegeeksnetwork.com community. See also the particularly interesting and funny chat transcript. 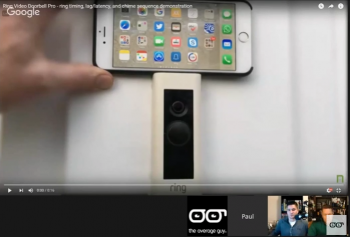 On the episode, I discuss my experiences with the Ring Video Doorbell Pro, NVMe storage on the Supermicro SuperServer, LED bulbs revisited, and much much more, including My Ring Video Doorbell story starts a new chapter with Ring Video Doorbell Pro. Please show your support of the Home Gadget Geeks podcast by visiting Jim's article above and subscribing, where you'll find the detailed shownotes with links to the various topics mentioned.